The time was THEN, as in way before now, to prepare for spring 2017. Phase 1 began with the selection and ordering of plant material. Phase 2 started in Dec.2016 with the planting of the cold hardy perennial plants. Speaking of cold hardy, we were surprised one morning upon arriving at the nursery to find a frozen irrigation pipe showering water over newly planted butterfly bushes and sedum. 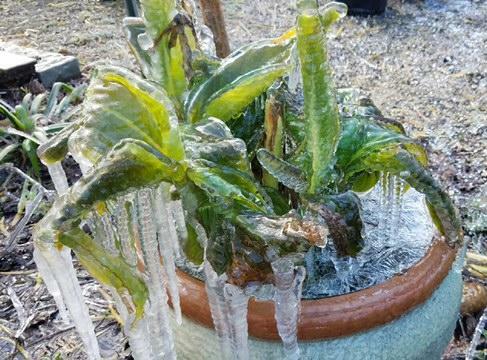 This might have been the first time for plant ice sculptures at the nursery! The irrigation was shut off, pictures were taken, warmer temperatures came and the ice melted. The plants were pruned and are now growing great and ready for sale. Talk about hardy! OH YEAH! Moving into week 7 of the new year, Phase 3 of production started with the delivery of over 1000 plugs of new baby plants. Who says you can’t have Christmas in April? Unpacking the plugs plants is totally different than unloading the plant “trucks”, even though they are all plants! 2016 is now last year but there are some plants that are back by popular demand for 2017. These plants include shasta daisy, 3 types of gaura, salvia may night and salvia caradona,There is also passion vine incarnata and passion vine Becky’s blue and white, monarda marshall’s delight, rudbeckia goldstrum, herbs pineapple sage and lemon grass. The newest clematis in the Maas garden is the montana rubens. You will want to get one of these fabulous clematis plants for your garden for these three reasons. First it is a vigorous grower, secondly it has crimson new leaves that mature to a bronzy green color (there are over hundreds of green shades by the way) and lastly this plant has fragrant pink flowers. Moving on, Maas has the latest editions of the perennial moscheuto hibiscus. This year’s selections include carolina pink shades, fleming’s moulin rouge and fleming’s purple hearts. These hibiscus have the largest of flowers of all hibiscus, There are blooms from 1 ft across on a plant 6-7 ft tall and 3 ft wide. Blooms start in June and continue through fall. If you were wondering about grass production this year we will be having pennisetum hamlin, northern sea oats, lemon grass and two types of sedge. There will still be some odds & ends of specialty plants for the garden which include but are not limited to the following: agastache, caryopteris, eupatorium, stokesia and tricyrtis. In closing, you will note that production plants have a “Thriver’s” I.D. tag in the plant pot. If you would like to read the tag, make sure you put it back in the pot so the next shopper can read it too. The production team thanks you and hopes you are as excited about April as we are. Have fun shopping and planting!